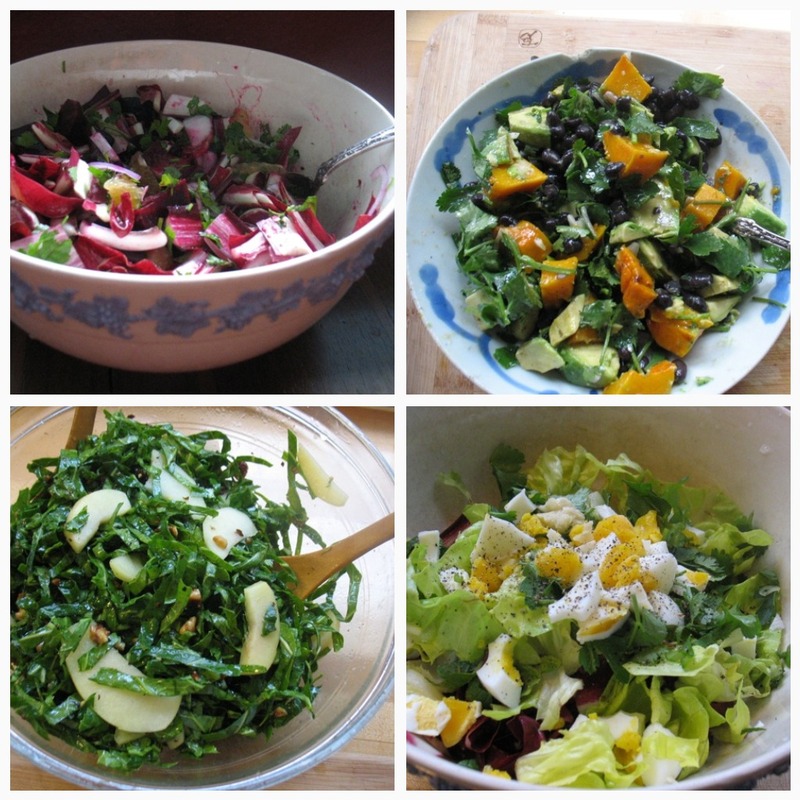 From top left: beet, orange and radicchio salad; roasted squash, black bean, avocado and cilantro salad; raw collards with pickled apples and toasted walnuts; and mixed salad with chopped egg. I got to have lunch with my mother today. You’ve heard about her many times here but not lately. I was standing at the counter in the kitchen this morning mixing yogurt into my muesli with fruit and granola and I had one of those moments where you catch yourself, you recognize yourself in someone else. You realize how fundamentally you’ve been shaped by someone else, you have similar reactions, tastes, expressions. . . . It made me smile, feel old and all-grown-up and quite comfortable actually. And then she came by for a quick lunch today. As per usual I tossed together whatever I had on hand to make a hearty salad. Today that was already cooked barley (Jet Barley) and already roasted squash. I had a few radishes, a lone scallion, some goat cheese (leftover from Saturday’s Improv class), a handful of parsley, a few leaves of romaine, and one puny slice of bread which I toasted and then tore up in to tiny bits. This all sounds rather odd but dressed up with a nice vinaigrette enlivened with my apple cider syrup it was just right–chewy, fresh, and rich from the squash and cheese. 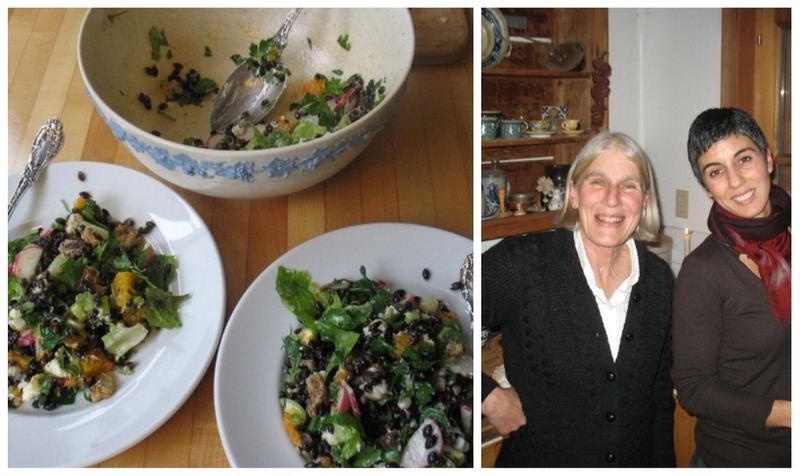 Barley, radish, parsley and squash salad and my lovely mother and me. I’m not suggesting you recreate this particular mix. What I do suggest–surprise, surprise (! )–is that you have cooked beans or grains or roasted or fresh veggies on hand so that tossing something like this together is a snap. My mother often does this and I remember her doing this especially when my father was away for work. Meals got simpler, less conventional (though she was never terribly conventional!). This winter I’ve been making random concoctions like this a lot and I’m getting better at them, with the exception of the one with grated rutabaga (which can be very good in salads), roasted beets, and radicchio. It’s fun to balance textures and flavors and create such colorful one-bowl meals with odds and ends. And I continue to be inspired by Plenty (the beet salad above, for instance) though I rarely have all the ingredients Yotam Ottolenghi calls for but his combinations are so brilliant and they’ve been adapting well. I realize I’m not giving you a precise recipe but you might not need one. Just think of your salad bowl and the contents of your pantry and fridge as your inspiration. Make a zippy dressing of some kind and see what happens. And if that seems too vague or scary and you happen to live in the Portland, OR area then come to the upcoming Pantry & Quick Meals or Kitchen Confidence (techniques, substitutions, etc. ) or Salad classes!